In his absorbing new book, Edmund de Waal, a British artist and potter, tells the story of his discovery of his own family’s part in that tragic history. The story begins, oddly enough, with a collection of Japanese figurines—small lifelike carvings in wood or ivory, known as netsuke, which served to fasten the cords of a pouch to a man’s belt. De Waal inherited a trove of 264 of these objects from his great-uncle—a standing warrior, a sleeping servant, rats, a couple making love, three toads on a leaf, and many more, including the titular hare. Some of the netsuke are studies in running movement, so that your fingers move along a surface of uncoiling rope, or spilt water. Others have small congested movements that knot your touch: a girl in a wooden bath, a vortex of clam shells…They are always asymmetric, I think with pleasure. As with my favorite Japanese tea-bowls, you cannot understand the whole from a part. The other challenge posed by the netsuke is more complex. “Owning this netsuke—inheriting them all—means I have been handed a responsibility to them and to the people who have owned them,” de Waal writes. The Hare With Amber Eyes is the product of his research into the lives of those former owners, his ancestors. De Waal’s father is an Anglican clergyman, and his father’s father was a Dutch Protestant; but the netsuke came to him from the family of his father’s mother, Elisabeth Ephrussi. And the Ephrussis were one of the great Jewish dynasties of nineteenth-century Europe, an international clan of merchants and financiers nearly as wealthy as the Rothschilds. In telling the story of the netsuke, then, de Waal finds himself telling one of the dramatic parables of modern Jewish history: the story of the rise, splendor, and dramatic fall of the cosmopolitan, culture-besotted, Jewish haute bourgeoisie. The Ephrussis came originally from Odessa, the commercial capital of Jewish Russia, where in the mid-nineteenth century Charles Joachim Ephrussia made an enormous fortune in grain dealing. “The Ephrussis were les Rois de Ble, the Kings of Grain,” de Waal records, and carved wheat-stalks figured in the décor of their palatial houses. In the 1850s, the patriarch embarked on a strategy of international expansion by sending his sons to different European capitals, as the Rothschilds had done. One branch settled in Paris, where they built the Hotel Ephrussi on the Rue de Monceau, famous at the time as the neighborhood of Jewish nouveaux riches. As usually happened in such families, the younger generation shifted its attention from business to culture—especially Charles Ephrussi, the youngest son, who was not needed in the office. He became a collector, art historian, and connoisseur of the first rank. He commissioned paintings from Renoir and Manet, gave a job to the young poet Jules Laforgue, and became friends with royalty and aristocracy. His apotheosis came in the work of another friend, Marcel Proust, who used him as one of the models for Charles Swann in In Search of Lost Time. 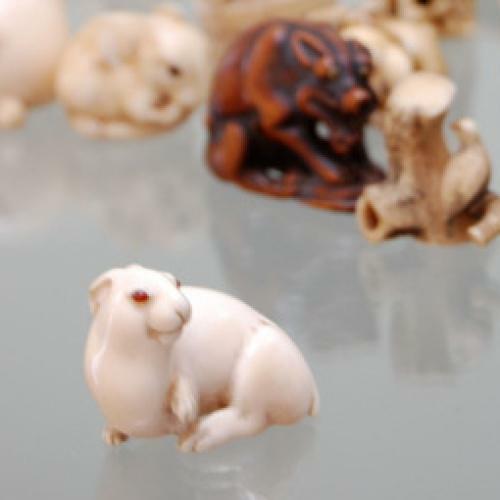 The most important of Charles’s purchases, for de Waal’s purposes at least, was the collection of netsuke, which he picked up at a Paris gallery in the 1870s. This was at the height of the French enthusiasm for japonisme, and de Waal writes very well about both the commercial and the aesthetic sides of this craze: “Japanese things carried an air of eroticized possibility … they were props for dressing up, role playing, the sensuous reimagining of the self.” Appropriately, Charles Ephrussi shared his passion for japonaiserie with his mistress, Louise Cahen d’Anvers, a married woman from another Jewish business dynasty. In 1899, Charles Ephrussi sent his collection of netsuke to Vienna, as a wedding present for his cousin Viktor, who was de Waal’s great-grandfather. As the narrative follows them, de Waal shows great acuity in distinguishing the kind of life the Ephrussis led in Vienna from the one they led in Paris. The Palais Ephrussi was similar to the Hotel Ephrussi—a showcase for new wealth, located on the Ringstrasse, in a tony Jewish neighborhood. But in de Waal’s telling, at least, Viktor Ephrussi lacked Charles’s connoisseurship, and he did not so much collect art as stockpile it. The netsuke joined “an accumulation of stuff from four decades of affluent shopping.” They ended up in the dressing room of Viktor’s young wife, Emmy, where her children would play with them while watching her prepare for balls and parties. Things were never the same after World War I, when the collapse of the Empire cost the Ephrussis most of their fortune and left Vienna’s Jews increasingly exposed to right-wing violence. The fatal blow came on March 10, 1938, when Hitler annexed the country. Almost immediately, de Waal writes, the Hotel Ephrussi was vandalized by Nazi thugs, then systematically plundered by the Nazi government. The Ephrussi Bank, the source of the family’s fortune, was Aryanized and its name changed. And the Palais Ephrussi was handed over, by an awful irony, to Alfred Rosenberg, the Nazi Party’s chief anti-Semitic ideologue. Thanks to their wealth and their connections, most of the family members managed to escape with their lives to England or America. And the netsuke, miraculously, were saved too—by the family’s Christian servant Anna, who stuffed them in her mattress for the duration of the war. They were among the only art objects to be restored to the Ephrussis, and the last part of The Hare With Amber Eyes tells the happy story of their temporary return to Japan, in the custody of de Waal’s uncle Iggy. By this time, however, the netsuke themselves—which are, disappointingly, never actually illustrated in the book—have receded into the background. In this book about people who defined themselves by the objects they owned, de Waal demonstrates that human stories are more powerful than even the greatest works of art.